You're African American, you're shoveling snow in your own driveway, and a white cop from another jurisdiction pulls up. Without as much as hello, he asks you if you're trying to make a few bucks for the holidays. A) Sue for a million dollars. B) Try to put the whole thing out of your mind. C) Decide that there ought to be a law...and then get one passed. 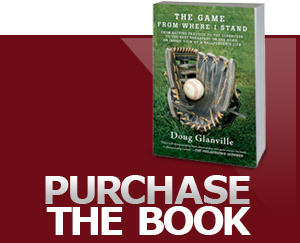 If you're former MLB star, acclaimed author, and ESPN commentator Doug Glanville, your answer is (C). In Connecticut as of October 1, thanks to Glanville and a team of his supporters, it is now codified that it is illegal for police officers to cross jurisdictional lines to enforce municipal laws from their own jurisdictions. You might say, that's not much of a law. "From the exposure of the most extreme events between law enforcement and citizens, and in particular, African-Americans over this past year," Glanville says, "there is a heightened awareness of the potential danger in an exchange between the two parties and the implications of what role race may play in the escalation of that danger." Glanville goes on to explain, "It is worth underscoring that a serious conflict could begin seemingly innocuously as mine did, when a police officer is sanctioned to operate off of a flexible interpretation of municipal law to confront a citizen. In my case, this even went over town lines." "Not all of these confrontations end with physical harm or grave injury, thank God. But many don't end well in other ways. We are becoming keenly aware that despite one's innocence, it is relatively easy to push the first domino in a scary domino effect. A downhill slide that becomes much more likely if you express any justifiable outrage." Outrage that is a natural reaction when you are the "wrong guy" being questioned or worse. "Yet," Glanville says, "once it starts down the wrong path, an insult turns into a slight, turns into a push, turns into a shove, turns into a punch, turns into a bullet if we are not careful. So it is important to take a long look at the beginning of these engagements before they lead to someone's end." And this holds true for both law enforcement and citizens whether in the moment or in some of the wanton retaliation we are seeing against officers. James Blake understands all too well the reality of Glanville's words. Glanville has taken these concerns to the legislature in the State of Connecticut. Under the newly clarified law in Connecticut, police can still cross lines to investigate, or hotly pursue active misdemeanors and felonies - real criminal activity. But they now have to be more cognizant of meeting the requisite burdens before acting in another jurisdiction. Police departments need to do more than act on what some of their constituents want. They need to treat every individual with fairness and respect. While a law may appear "facially neutral" in language, the human element of how it is enforced is where the bias resides. Glanville's law may well save lives. According to news reports, police have killed 24 unarmed black men in 2015 so far. Glanville, reared in a family active during the integration of his hometown of Teaneck, New Jersey, used his unpleasant encounter with the non-local officer as a point of entry into the state of relationships today between police and African Americans. "Broad interpretations of municipal law can provide officers the bandwidth to get involved in pursuing 'suspicious' activity. However, when acting outside the scope of a police officer's jurisdiction, a place where he or she is more likely to be unfamiliar, bias can be a primary driver of engagement, whether conscious or otherwise." "In our neighborhood," testified Glanville neighbor Richard T. Keppelman who supports the new law, "we do not fear or suspect people of different cultures or appearances; it's all part of a shared social landscape. I am sure that this is true of many other cities and towns in the State, but, unfortunately, not all. Accordingly, a police officer operating in a jurisdiction other than his own may not fully appreciate the social environment and community expectations of a different neighborhood. What is expected of a police officer in one community may not be acceptable in another." Because of this new clarification in Connecticut law, the statute outlining extra-jurisdictional engagement is now a lot clearer. Glanville hopes that other states will review their statutes to make sure laws meant for one purpose are not used for another purpose for which they were not designed. Glanville, who neither sought nor received an apology from the police officer who profiled him in his driveway, began his quest for justice in a conversation with his wife, an attorney and a former Philadelphia public defender. He then talked with neighbors, who were deeply upset by the incident. One such neighbor was State Representative Matthew Ritter, who ultimately drafted the bill. Connecticut Governor Dan Malloy ceremonially signed it into law last month, although it officially became law in mid-June. The Mayor of South Windsor, Connecticut, M. Saud Anwar, M.D., wrote in support of the bill that it would "make it less likely that a non-involved person is wrongly identified as a suspect." One of the biggest challenges those in law enforcement face is avoiding a sense of "us versus them" - that the public they are meant to serve are somehow the enemy, and that a cop's only friends are those on the same side of the thin blue line. It's hard not to empathize. Police officers put their lives on the line every time they put on their uniforms. Often, individuals they encounter aren't just ungrateful for the efforts of law enforcement. Some can be hostile and even violent. So the easiest course for a police officer is to see every potential interaction as adversarial and every person with whom they interact as a suspect. It may be understandable, but perhaps that kind of attitude has led to the numerous instances of excessive force and killings of unarmed men in the last year. When a defensive stance toward the community morphs into outright arrogance, trouble and tragedy are the all-too-likely outcomes. And, people are left feeling hostile, on edge and unwelcome in the community where they live. How does it feel to affect the way police can interact with citizens in this time of racial polarization? "I felt a whole host of emotions," Glanville admits. "Front and center was a sense that I had reached a checkpoint along an arduous journey. There was relief, but also a feeling that the work has just begun. "Our country is unquestionably at a crossroads and I believe the way we were able to legislatively address my experience is an important part of the puzzle. "We have seen protests, tears, frustration, collaboration, legislation, and sometimes violence. I am glad that I was part of a process that was open, peaceful, strong, and legally sound." Glanville describes himself as "realistic" about what the new law will actually accomplish. "We have to face that our country needs dramatic change in this area," he says. "Some communities have been isolated for decades. They are frustrated and live in constant inequity where they are punished by bias - implicit or unconscious. "I certainly have some means by which I can escape aspects of it, but I cannot escape being a man of color, nor do I want to do so. "We can do better as a society to face ourselves and work towards the great tenets of equity that our country set out to create." The question that law enforcement officers must ask is this: is their main priority establishing justice, or is it serving the community in which they operate? There should be no conflict between these two goals. In reality, the two goals can conflict. In order to establish justice, the rights of the individual must sometimes be sacrificed. Or at least that's how the argument goes. The question can come down to whether the ends of justice justify the means of confronting, stopping and frisking, or otherwise intervening in the lives of community members. The counter-argument, of course, is that if the hands of the police are tied, criminals will run roughshod and no justice will be served. It turns out that the thin blue line between law enforcement's need to act and the community's rights to be unmolested is an extremely thin line, indeed. Glanville says he realizes that not everyone has the resources, time, or connections to accomplish the passage of a law, as he did. "I am glad I was able to find this approach as an option," he says. "I discovered unexpected reward in restraint, in taking time to hear all sides of the story, and to formulate a thorough response. "I also have learned how hard it is for most citizens to walk through such a protracted process. It is painstaking and time consuming without any guarantee of success." Glanville says he remains optimistic about the future of relations between African Americans and law enforcement, based on his own experience. "When my father died in 2002," he recalls, "our procession to the burial site was escorted by the Teaneck Police Department, my hometown police force that employs many of my old high school and summer baseball teammates. "My father did a lot of work with police departments as a psychiatrist and his service was remembered fondly by law enforcement. They came in strong numbers and in uniform to his service. It was very moving for me." "Then there was when I was having a tough season with the Phillies and was pulled over for speeding on the New Jersey Turnpike. The State Policeman saw my license and told me to not worry about my batting average, but that my value to our community is priceless. That really had an impact, especially given that my father was gravely ill at that time. So I have many positive experiences with law enforcement to tap, which is part of the reason I am optimistic and why it is reasonable to expect more from an exchange with an officer. I invested a lot in this process and you invest when you believe something can change, that you have real evidence and experience like I have had, that an interaction with law enforcement, even under some stress, can be resolved with respect. Particularly when the alleged infraction is not a serious crime. In his testimony supporting Glanville's bill, the President and CEO of the Boys and Girls Club of Hartford, Samuel S. Gray, wrote, "An exchange with an officer is a high stress encounter. We should reserve those encounters for the most critical of issues." When the bill was signed into law, Connecticut Governor Dan Malloy told Glanville, "If no one else has apologized, I apologize for the hassling you took," said Malloy. "But I think out of that gave rise to a meaningful piece of legislation an important piece of legislation." Not everyone fell into line, however. The Connecticut Police Chiefs Association opposed the bill, seeing it as an undesirable limitation on law enforcement and an unwarranted nod toward political correctness. The Chiefs argued, in a prepared statement, "[t]he emotional enactment of legislation in response to an isolated incident is not good policy." The law's supporters contend that the many individuals whose rights are compromised in the name of establishing justice are overlooked as part of the process, and that Glanville's experience is not isolated, but indicative of a more common and unacceptable problem. Glanville responded, "[D]on't make it about me....I can have a voice here, but so many cannot. The fines are oppressive. Transportation to defend themselves is unavailable. Work or family obligations prohibitive, municipal courts may be gummed up." In an era of increasing police violence against unarmed individuals, is writing a law enough? Or should concerned individuals do even more - march in the streets, take to social media, demand investigations into questionable actions by law enforcement? America was founded as a society governed by "laws, not men." The sincere hope is that by changing the law, we change hearts. American society, while still far from perfect, is immeasurably better than it was, from the standpoint of race relations, 50 years ago. What changed back then? Law. And once law changed, so did society. So if others follow Glanville's lead and seek to encode their intentions for a racially sensitive society into law, only good can result.